As more of an intellectual horror film, The Witch made the audience think and interpret where the true evil comes from. While The Witch garnered critical acclaim when it debuted in theaters in February of this year, it was met with less than enthusiastic audience ratings. After having viewed the movie, I have been contemplating it, and the more I separate myself from the film, the more I can see how it would be praised form a cinematic standpoint, yet not do as well profit wise. 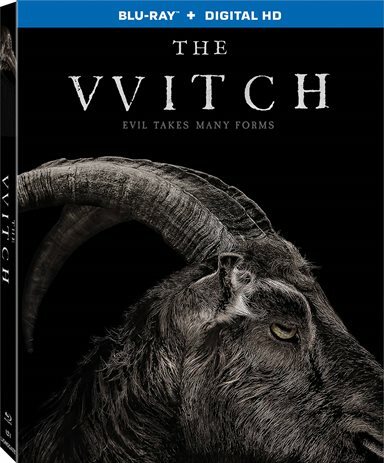 Set in 17th century New England, The Witch is based on the folklore of the era. At a time when the Puritans feared witchcraft and the Salem witch trials were rampant in the area, people were paranoid and willing to accuse anyone of practicing the art and having supernatural powers. For Thomasin's (Anya Taylor-Joy; Atlantis) family, this belief was no different. When Thomasin and her family disagreed with the members of the church, they were exiled from the plantation and sent to live off on their own in the wilderness. As good Christians, they denounced any form of witchcraft and prayed every day for their life of labor and struggle to be easier. Although they had no reason to doubt God, or each other, their family begins to implode as strange events start occurring and the baby of the family goes missing. As horror movies go, it isn't the typical blood and gore and scares that have you jumping out of your seat, but more of a suspenseful, psychological view into the breakdown of a family. There's a sort of build up to an anticlimactic ending, which is part of what probably made the audience not connect to the movie. This film didn't particularly bother me, and I am not much of a horror movie fan, so I can only guess that for many die-hard horror fans, there wasn't enough traditional adrenaline pumping moments to satisfy their "excitement" high. As more of an intellectual horror film, this movie made the audience think and interpret where the true evil comes from. As Taylor-Joy reflected in one of the extras on the Blu-ray, the film is more about the family and how they fall apart as unexplained phenomenon continuously occur and start to blame one another (especially Thomasin) for the events that unfold. The deterioration of the humans involved is the real horror in the end. The beauty of this film, though, is in the details. First time feature film writer and director Robert Eggers meticulously researched the Puritan folklores and the Salem witch trials to bring a rare and true authenticity. He also held the set and costume designs to the same standards and the outcome is a magnificent array of craftsmanship that helps set the backdrop. The feeling of old New England permeates every shot and the Canadian wilderness is a striking access to lend a sense of overall eeriness. The cast, though many of them young, are excellent. Taylor-Joy and Harvey Scrimshaw (Oranges and Sunshine) bring a maturityto their characters that belie their ages. Ralph Ineson (Guardians of the Galaxy) and Kate Dickie (Prometheus) lend their formidable acting talents to the film by showcasing the younger actors, while still maintaining their own presence in the scenes. The only drawback to the realness of the movie was that their accents and faced paced dialogue made it difficult to under stand them at some points. The Blu-ray is presented in 1080p high definition video with a DTS-HD 5.1 master audio soundtrack. The images are sharp and the audio is clear though not mixed well. The set features only two extras that are not necessarily noteworthy. The first is interviews with the cast and crew and the latter is a Q&A after a screening that took place, appropriately, in Salem, Massachusetts. The details and background made the film a success with critics but it lacked more content and I walked away wanting to know more about why these supposed witches stalked this family, killed their infant son and destroyed their lives. The plot could have been fleshed out more completely and the horror parts could have been scarier. While I appreciate that Eggers wanted to stay true to the old tales and not deviate, the story seemed incomplete and felt me feeling unfulfilled. Download The Witch from the iTunes Store in Digial HD. For more information about The Witch visit the FlickDirect Movie Database.